When the Egyptian Revolution began, Sharif Abdel Kouddous was at the Sundance Film Festival in Utah, covering independent film for Democracy Now!, where he was a producer. Four days later, Kouddous was in Cairo, where much of his family lives, documenting the unpredictable twists and turns of the occupation of Tahrir Square. Day after day, Kouddous returned to the square, reporting from the heart of the action, often amidst outside skepticism about the movement and its strategies. By early March, Kouddous had left Democracy Now! and was reporting on the revolution for various news outlets as a freelancer. Being a reporter for alternative media, free from the corporate media’s expectations of what he calls a “false sense of objectivity,” has been crucial to his success in telling the story of the uprising from close up. 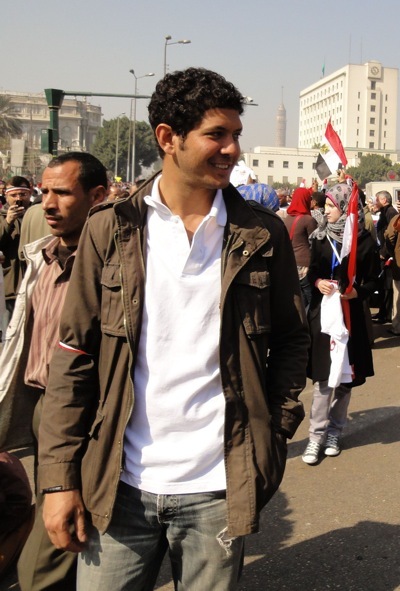 Additionally, Kouddous’ Egyptian roots — though he has lived most of his life in the States — not only helped him connect to people in Tahrir but also gave him insight into the way the revolution in Egypt was reshaping class boundaries, as people from diverse backgrounds came together to bring down a dictator. Revolutions are messy and difficult to follow, whether you’re an active participant, an interested outsider or a journalist. The traditional way for a reporter to approach any story is to get quotes from a variety of sources, including experts and people in positions of power, so as to provide some measure of perspective and balance. But the revolutions that swarmed over the Arab world in early 2011 posed — as perhaps all grassroots politics poses — a challenge to the relevance of journalism’s standard toolkit. Could the governments of Tunisia or Egypt, so anxious to hold onto power in the face of populist revolt, really tell journalists anything that could be trusted, or anything that would help the world understand how the movements were progressing on the ground? Meanwhile, pro-government mobs were attacking foreign reporters, making it difficult for them to speak with pro-Mubarak loyalists and hear their version of things. In our conversation, Kouddous explains why being an independent journalist proved to be an ideal position for reporting on the Egyptian Revolution. He has remained in Egypt since then, reporting with the support of grants from The Nation Institute and the Pulitzer Center for Crisis Reporting. Kouddous was the subject of a recent HBO documentary, In Tahrir Square, which chronicles the first 18 days of the sit-in. He continues to appear on Democracy Now! and writes frequently for The Nation and The Egyptian Independent. Kouddous’ own website is EgyptReports.net. Journalism goes way back for you and your family. Tell me about that. My father is always very proud of the fact that I’m a fourth-generation journalist. My great-grandmother was a renowned magazine publisher, an actress and a leading feminist. Her son was a famous journalist who exposed corruption in the pro-British monarchy and was jailed by the government for speaking out after Nasser, and he became a famous author after that. His son, my uncle, is a leading dissident in Egypt, a well-known writer and a protester as well. So, it’s an honor to carry on that family tradition, and try to speak truth to power as my uncle and great-grandmother and grandfather have done. How did your background impact your reporting in Tahrir Square? When the revolution broke out, those twin strands of covering it as a journalist and being a part of it as an Egyptian citizen — I think if you looked at my reporting at the time, there’s no question as to where my allegiances lay. But I also think there’s a false sense of objectivity that permeates the corporate media that actually hurts their coverage, where they give equal weight to both sides regardless of where the truth is. How did you see that “false sense of objectivity” play out in the coverage of Cairo? I think you saw that, in the beginning of the revolution, when people weren’t sure where things were going, you had the corporate TV network reporters saying, “Well, the Mubarak regime says this, and the protesters say this,” and kind of equating the two. But a few days into the revolution there was an attack on many Western reporters by the Mubarak regime, most notably Anderson Cooper. So immediately after that, their coverage changed, and they were saying, “This is a popular, pro-democracy uprising that’s being attacked by a 30-year autocrat.” That’s what is important — calling things as they are. And I don’t think that I, being an Egyptian citizen who supported the revolution, wasn’t able to also cover it in a professional, journalistic way. It was a challenge to strike that balance, but a rewarding one for me personally. You’re from a wealthy, highly-educated family. How did your class background affect your view of what was taking place? I was born in the U.S., but I grew up in Egypt from the age of 4 until I went to college in the States. I’ve visited Egypt every year, and I was never connected with any social movements or political circles in Egypt. This was a big opening for me to see this world in Egypt that I hadn’t been exposed to. Egypt is a very stratified society, class-wise, and I was from the upper class. There’s very little mixing of social classes. But that was the beauty of that first sit-in in Tahrir — and since then, really — it brought a lot of these stratified classes together. It was an eye-opener to be sitting, talking to people from all walks of life, from all across the country, who were united in a similar goal. It was a very rewarding experience, and I think it’s one that existed in Egypt before, just one that I wasn’t exposed to, because I hadn’t really moved in those circles. But I think the revolution broke a lot of those barriers, and those barriers would be hard to re-erect again. Reporting from the square at the time was amazing; it was amazing to get Egyptians from all walks of life in one place. People had very different upbringings, very different desires, but were supporting each other and uniting together to topple a regime. How did you pinpoint whom to talk to when there was so much uncertainty and ambiguity? It wasn’t hard to report during that first sit-in because all the action, all the organizing, the whole story, was very localized in Cairo, in Tahrir. If anyone was getting arrested outside the square you could find out inside the square — there was an information center. You could see the sit-in develop into people manning the outskirts of the square — until the so-called “Battle of the Camel,” when Mubarak sent in his thugs. You could see them organizing clean-up crews. It was easy to go around and just talk to people. And I think that’s one of the benefits of independent journalism: You can talk to people and hear people’s opinions, why they are there, their hopes and desires, as opposed to getting experts or so-called pundits to explain to people why they are there. Did you try to follow key organizers? The strength of the revolution — some say it’s a weakness now, but I don’t agree — was that it was leaderless. There were definitely key groups who had laid the groundwork, and key activists who had been struggling for years. My uncle was one of them. But decisions were very de-centralized. It was almost an organic decision-making system, where the combined intelligence of the square kind of knew what to do best, and there wasn’t really any one organizer. How, then, did you decide which stories to tell and which people to follow? I did link up with some activists who had been demonstrating for many years, and were kind of at the heart of the revolution. They had their own space in Tahrir Square, and I would go visit them every day to find out whether there were any plans to do any tactics or any marches. An activist gave up his apartment that overlooked the Square, where people could go to get online and get the word out. There were different ways, different people to talk to. The square kind of became divided. There was a Muslim Brotherhood area. The Mubarak regime was trying to meet with different people from Tahrir, and some actually did go and meet with the regime, although many disagreed with their actions — so I talked to those people. There were various ways of getting in touch with those at the heart of it. What kinds of debates were they having? I think people forget that there was, at various moments, a lot of pressure on the protest movement to end the sit-in — that enough concession had been given, that the point had been made and now it was time to return to some kind of formal political process. My personal view was that the sit-in was the way to go. Did you, then, feel any contradiction between having ideas about what the movement should do and reporting on it fairly? I suppose you have to kind of distance yourself and try to assess it in a journalistic way, or speak to different people and get different points of view. But it’s a challenge to do that in any story, regardless of what you’re covering. Everyone has their personal point of view about any issue. But I think I managed to do it. So, not objectivity, perhaps, but distance. What are you reporting on now? There are a million stories in Egypt, all the time. There’s an elected parliament that’s dominated by Islamists. There’s a splintering of many different protest groups by strategies and ways of moving forward, because after a year of protesting and sit-ins, people are looking for different tactics. There’s also a burgeoning independent media movement in Egypt that I find very interesting and very powerful. There’s this whole issue of the NGOs that are being cracked down upon; while the Western media covers the U.S. and German organizations that have been raided and stand accused, I think the real danger is the Egyptian human rights organizations that are getting much less international attention but are also being shut down — this is a real attack on civil society. These next six months are going to be pivotal for the future of the country. And whenever there’s direct action and protest, I go to cover that, because that seems to be the front lines. How so? From here, it seems like a lot of the action in Egypt right now is at the ballot box. The only achievements this revolution has gained so far have been on the streets. This may change going forward. But the Supreme Council of Armed Forces has said, “We won’t respond to any pressure,” even when they’ve demonstrated that that’s the only thing they respond to. So, this has been the main tactic for revolutionaries over this past year. Now that we have what’s widely regarded as a legitimate parliament, that may change. But over the last few months there’s been a significant crackdown; over one hundred protesters have been killed, and they’re using live ammunition and rubber bullets. The stakes have gotten higher. The army issues complete denials of wrongdoing despite clear video evidence to the contrary; when they run over people with APCs [armored personal carriers], or shoot people with live ammunition, they deny it. I think it’s very important that you have credible reporters on the front lines to give an account of what’s happening. You mentioned the burgeoning independent media there. Are people in Cairo getting the kind of news that they need about the movement? The vast majority of Egyptians get their news from television — 90 percent, I think — and a lot of that is dominated by the state media, which is essentially a propaganda arm of the government, and the government right now is ruled by the Supreme Council. But the independent media movement has been using video to document activism and getting testimonies from activists. So does that provide a counter-narrative to the “false objectivity” of corporate media that you spoke of? What’s happened is these videos have circulated so widely online, and have had such an impact, that the traditional media starts to report on them. You’ll find the private television channels, which have significant reach, speaking to the activists who are documented in a video or the ones who shot it — so there’s a trickle-up effect in journalism. There’s also been an interesting reclaiming of public space through media — because these activists are all but banned from appearing on state media. There’s been this campaign called The Generals Are Liars, where activists go to neighborhoods, set up a screen on a sidewalk and just air footage of army abuses on the sides of a building, and people gather around and watch. A lot of people have never seen this footage. Then there’s some kind of a Q&A or debate afterward. It’s really grown, and it’s very decentralized — anyone can be a part of this campaign — and there’s now a few happening each day in Cairo. It’s a creative reclaiming of public space to reclaim the media.